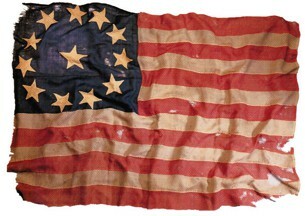 Millard Fillmore's home in East Aurora, NY, has a twelve star American flag on display but know fairly little about it. Twelve-star flags appear to be "exclusionary" flags. This was all the rage from about the mid-1850s to the beginning of the Civil War in 1861 when President Lincoln insisted U.S. Flags bear the full complement of 34 stars despite the secession of a number of states. The funny thing here is that it appears to be a "pro-slave state" version in a non-slave state (NY). However Fillmore is often counted as pro-slavery (even though he wasn't) because he signed the Compromise of 1850 and the Fugitive Slave Act. This flag may have been sent to him intended to be a form of an insult and the form would have been very well understood in the late 1850s. It is hard to say exactly without more details on the flag's history and connection to Fillmore.